Vashon Island is a wonderful, close to home (still in King County!) destination for a weekend (lots of vacation rentals) or a day trip any time of year! 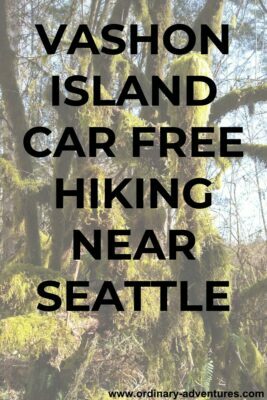 Vashon Island Hiking is a great car free option if you want to find a hike near Seattle you don’t have to drive to (read about other ways to take public transit to trailheads near Seattle here). I’ll describe some trail options first, then how to get to the trailhead by bike (and ferry), bus (and ferry) and driving (and ferry). No matter what, you’ll be taking a ferry to go to Vashon Island, which is all part of the fun. View north from the ferry on the way to Vashon Island Hiking! Island Center Forest is the closest hike to the Vashon ferry dock, which is worth considering if you’re on a bike or on the bus. Island Center Forest is a restored forest now part of King County Parks and managed in partnership with community groups (no parking pass required). There are about 10 miles of trails in the park, most are open (and would be enjoyable) for bikes as well as hiking. There are some hills here and there, but a lot of flat trails as well. It’s worth grabbing the map at the trailhead or getting it online here, because there are lots of junctions and trails going lots of places (there are also four trailheads, the 188th trailhead is closest to the Seattle ferry). The trails themselves are similar to many in Western Washington, a peaceful second growth forest with a million birds (especially Pacific Wrens) singing. It’s also a great hike to take with a dog. The Island Center Forest is very green and lush, even in winter! 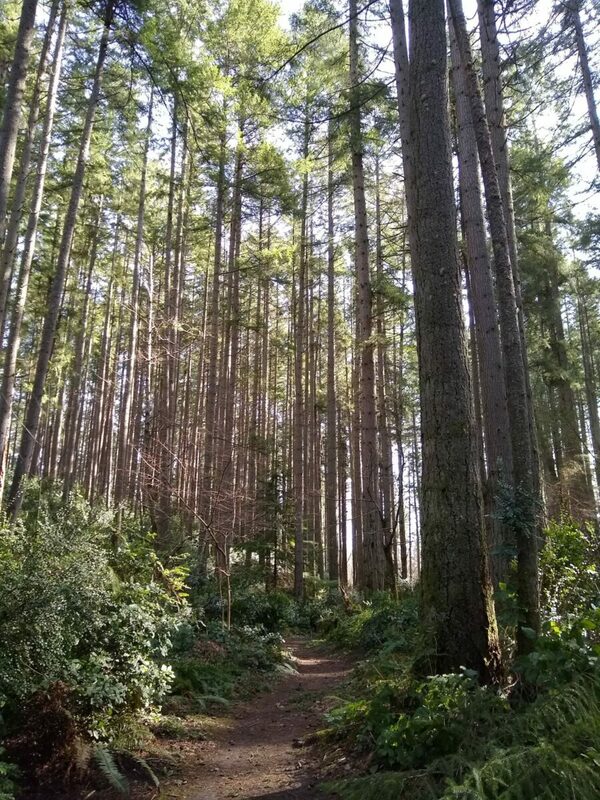 If you’re looking for bigger views, or a beach visit, you could go to Dockton Forest/Dockton Park, which is further away from the Seattle or Tacoma ferry, but also accessible by bike and bus as well as car. Another awesome Seattle blogger, Wet Boots Dry Hops recently wrote an excellent trip report on the Dockton Forest hiking trails, check it out here. Wet Boots Dry Hops also has an excellent review of a great post hike food and drink option in the center of Vashon, Vashon Brewing Community Pub! The trails in Island Center Forest would be fun to bike, and some of the Dockton Forest trails are open to bikes. You can also leave your bike at the trailhead and hike the trails after biking to them! To get there from Seattle (you can also take the ferry from Pt Defiance in Tacoma to the south side of the island in Tahlequah), first you’ll need to get to the Fauntleroy Ferry Terminal. You could either bike there from home, or you could take your bike on the Rapid Ride C Line to the fauntleroy ferry terminal. Biking on the ferry has some big advantages over driving, it’s much cheaper (you pay a passenger fare ($5.55) plus an additional $1-$4 for the bike on different routes-it’s $1 on the Vashon route) and you never have to wait for a full ferry. To take your bike on the ferry, you’ll pay your fare and line up in the same area as walk on passengers (you can ask any ferry employee if you’re not sure what to do). The ferries ask that you arrive 20 minutes before the ferry departure. The Vashon ferry goes frequently, you can also check the schedule here. Typically you will load before cars and unload before cars as well, but the crew will direct you where to go. Once on board, you’ll see yellow ropes along the railings that you can tie your bike to. Once on the island, you’ll unload before the cars and then you’ll hit the hardest part of the ride, the ferry hill! You can always take the bus or walk up the hill too if you’re not up for it. The ride to the Island Center Forest trailhead is about 6 miles from the ferry, going through the town of Vashon (where the restaurants and shops are). After the ferry hill the ride is mostly flat. You’ll stay on the main road until you turn right on SW 178th St (just past the town), then left on 103rd Ave SW, right onto Gateway Trail and finally right on SW 188th St (there are signs when you leave the main road). To continue on to Dockton Forest, It’s an additional 6 miles. Instead of turning right past the town, continue straight to SW 204th St and turn right, then angle right onto Monument Road, and angle left onto Quartermaster Drive. Turn right onto Dockton Road which will take you straight to the park! I am a big fan of hikes I can take transit to (which isn’t as many as I would like around here!). Our family is a one car family so driving isn’t always an option, I also like the lower impact on the environment, and sometimes I’m just done with driving! To get to Vashon Island hiking by Bus, first you’ll get to the Fauntleroy ferry terminal in West Seattle on the Rapid Ride C Line. Then, you’ll take the ferry to the Vashon Terminal, and then ride King County Metro Route 118 or 119 to Island Center Forest, and 119 to Dockton Forest. If you come from Tacoma, you’ll be at the Tahlequah terminal at the south end of the island, which also connects to the 118. You will have to walk about a mile from the bus stop to the trailhead, but since you’re hiking anyway, who cares? From either direction, get off at SW 178th (you can tell the driver where you want to get off), and go southwest (you’ll see signs). You can also drive to and around the island! Be aware that on Friday evenings and Sunday/holiday afternoons there may be long lines for the ferry and you could be waiting awhile (Fridays going to the island, Sundays or holidays returning to Seattle). In addition, taking a care on the ferry is expensive ($15.40 for the car and driver and $5.55 for each additional person). Once on the island, the distances are short and the drives scenic! You can access the same trailheads the same way described above.